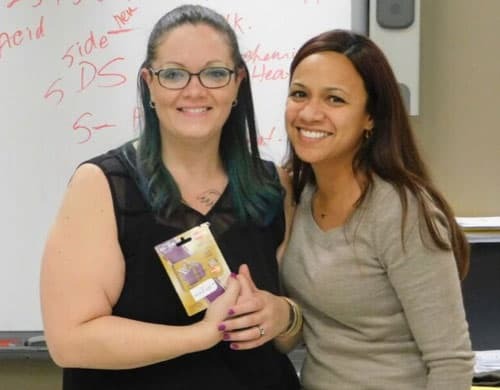 Jessica Almonte, Admissions Representative, presents Cosmetology student Shannon Moenich with the gift card she won in the Good Deeds essay contest. January 2017, Margate, FL – Shannon Moenich is working at Applebee’s while she pursues her education in cosmetology at American Institute. In December, the restaurant hosted its annual ‘Breakfast with Santa’ event, which raises funds and collects donations for Toys for Tots. Shannon shared the story of her experience serving at the event in an essay submitted to the Margate campus’ “Good Deeds” contest. “I remembered the many breakfasts with Santa my parents brought me to and the magical delights of those moments,” Shannon said. “I knew I had to participate in the event, because it is so important for the children, who believe in the magic of the holidays.” For three weeks, Shannon told all the families she served at Applebee’s about the Breakfast with Santa event. She sold 39 tickets, including two for her husband and her ten-month-old daughter, Charlee. “Even though money is tight in my family, I knew the price we paid for the tickets would help a child who had no Christmas coming,” Shannon said. “Our Christmas tree would not have any presents under it either, but at least my daughter would get to meet Santa for the first time.” On the day of the event, the jolly old elf arrived right on schedule, on a fire truck rather than his traditional sleigh. Wearing her own Santa hat, Shannon cheerfully brought out pancakes, sausage, eggs and chocolate milk for the families in attendance, earning $42 in tips. “I considered keeping my tips, because we could really use the money. But I decided to donate the $42 to the toy drive,” Shannon said. “Times are hard for us, but somewhere they are even harder for another family.” The Good Deeds essay contest provided an opportunity for Shannon and other students at the Margate campus to share their stories of service, which is a core value at American Institute. Shannon’s essay ended with the words, “Good deeds are contagious. Paying it forward is something that we should do. My Christmas is complete.” As it turned out, there was one more gift under the tree for Shannon. Her essay won the contest drawing, and she was presented with a $150 gift card. Happy Holidays, Shannon, and thank you for your generosity and dedication to your community.